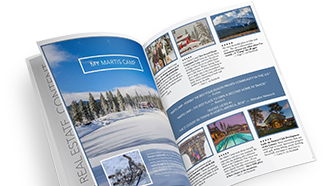 Among Martis Camp’s many distinctions is our unique multi-generational Club membership structure. Unlike most private clubs, Martis Camp welcomes the extended family of Club members to enjoy our facilities as family guests. In the true spirit of family, Martis Camp memberships can be passed on to future heirs, generation after generation. Consider this your invitation to bring your family together in one of the country’s most magnificent places. Social Membership is included in the purchase of a developer homesite, subject to membership application and approval/acceptance by the Club. Martis Camp Golf Membership can be purchased for an additional $130,000, limited to a maximum of 375 golf members. Call us today at 1-800-721-9005 to discover how Martis Camp Club Membership can benefit you and your extended family members. The Camp Lodge with formal and casual dining venues and terraces, fitness center, club day spa, men’s and ladies’ locker rooms, outdoor lap pool, soaking and jetted tubs, and golf shop. The Family Barn with art loft, bowling lanes, 44-seat theater, summer swimming venue, indoor basketball court, performance stage/outdoor amphitheater and soda fountain. The Beach Shack on Lake Tahoe offer one acre of sand, sun and grass right on the shores of Lake Tahoe. Also enjoy valet parking, kayaks, paddle boards, sand toys/games, casual dining fare and beverages, chaise lounges, towel service, shower suites, restrooms and lounge area. Park Pavilion and Sports Field with croquet, bocce ball, sand volleyball, basketball, labyrinth, horseshoes, play structures, family grill area, fire pits and outdoor seating. Over 20 miles of Community Trails, for hiking and biking in the summer and groomed cross country skiing and snowshoeing in the winter (winter conditions allowing). Lost Library with a classic book collection for all ages and interests, community garden, turf area with children’s play area, horse shoes and northern trail head for community trails. Tennis Pavilion with four courts, two clay and two hard surface. The Springs Park Pavilion and Tree House with family grill area, fire pits and outdoor seating. Aerial Adventure Park located next to Lookout Lodge with 4 levels of ropes courses and zip lines – ranging from a passive course on up to an advanced course 15-20 feet above the ground.